Note: Offers on the asking price may be considered. In current category this MFV has been at sea, almost continuously for the last years. Surveyed in 2017 she is the epitome of the strength of construction of these scottish MFVs with her massive doubled timbers and this vessel has had a unique overhaul in the 2000s to create an extensive living area and wheelhouse in Aluminium. Her accomodation is huge and is completely refurbished and as the photos show is in lovely condition and she would make the perfect liveaboard. Currently rearranged as berthing for 12 plus, nonetheless it would be an easy job to convert her back. But it is the heart of the ship that is the real prize, the Gardner 803B , which is in pristine order coupled with a recently overhauled gearbox linked that drives a 4 bladed prop. And up top in the wheelhouse, a late date navigation suite sporting two radars and everything required to take her touring. So here we have a commercial ship ready to work, we have a touring ship for coastal cruises and finally we have a great liveaboard space....but it is the aesthetic that impresses, not only is her styling so complete but the feel onboard is good. The list of suitability goes on and on, she is self sufficient not requiring shore power, her overall condition is as you see and just to top it off, should you require her master will make sure you are comfortable helming her, although she may appear large in reality she is only 80 foot at the waterline , so she need not overwhelm the low hours skipper. 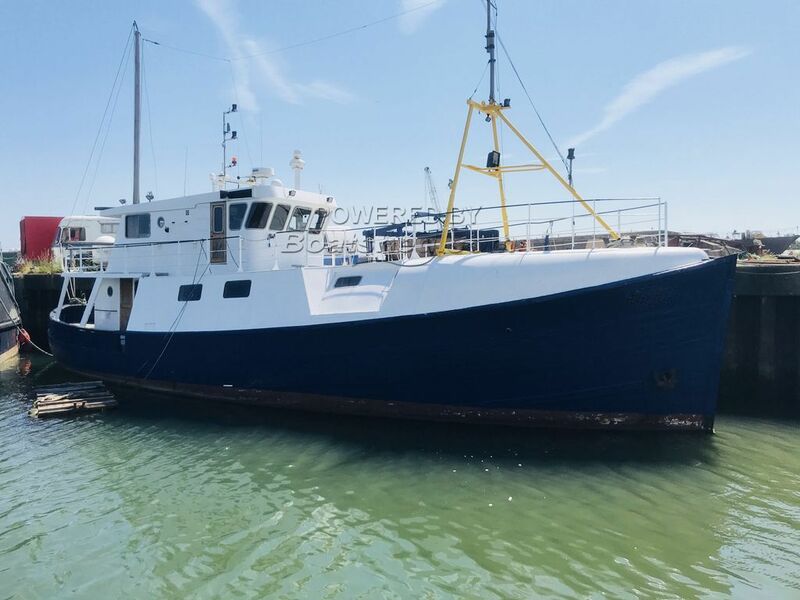 THis ship is one of the finest we have listed in many a month, character, apparent condition, space, suitability and price. Our master seeks to retire and is being extremely pragmatic, do not delay. This MFV 80 has been personally photographed and viewed by a representative of Commercial Boat Sales. Click here for contact details.